see the information given below. Click here to see the official notification of NEIAH Recruitment. 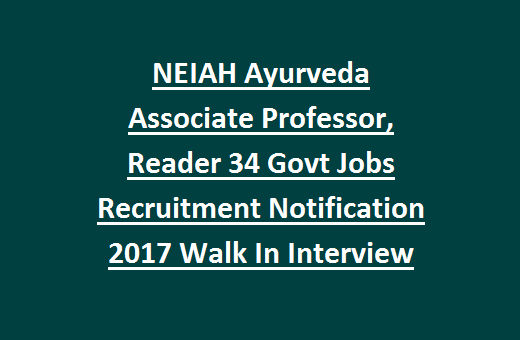 Walk in Interview dates: 14th & 15th February 2017.
degree in Ayurveda in relevant subject. combine experience as asst professor/ Lecturer in the concern subject. experience as asst professor/ Lecturer in the concern subject in Govt College. 39,100/- plus other allowances as per Govt rules. Relaxation of age will be given as per Govt. rules. Walk in Interview/ Test scheduled at Office of the Director, NEIAH, Shillong. Interview on 14th & 15th February 2017 at 9.00 AM. For remaining posts is on 15 February 2017 from 9.00 AM. copies, 2 passport size photographs at the time of Interview.